A LAWYER FOR Sandip Mooneea, one of the men acquitted of all charges related to the killing of Michaela McAreavey, has compared the investigation and trial to that of the Guildford Four. After spending 15 years in prison, the Guildford Four were finally freed in 1989 when their convictions for bombings carried out in the UK in the early 1970s were quashed. Speaking in Mauritius today, Rama Valayden said that history has shown that when “we rush to find justice, we always fail”. 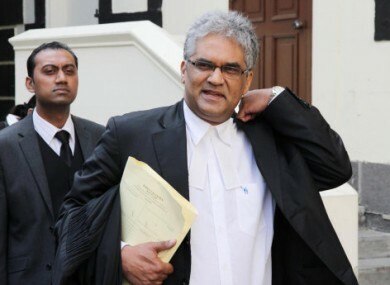 He was highly critical of the police investigation which saw his client, as well as his co-worker Avinash Treebhoowoon, charged in connection with the death of the 27-year-old newly-wed.
Treebhoowoon, the younger of the two men, retracted a confession he said was made to police after he was brutally beaten and tortured. Commenting on alleged police brutality, the counsel for the defence said that “the government needs to act on this form of aggression, the laws need to change, and the investigators need to be investigated”. Valayden said that the real culprits could have been found but that politicians and police were trying to “appease the crowd”. Speaking to reporters outside the courthouse immediately after the verdict, Mooneea said he was “very sad” about the lady who came to Mauritius and was killed. The 42-year-old former hotel supervisor has always maintained his innocence, claiming he was on the phone to his sister when Michaela was strangled in room 1025 of the Legends hotel. His co-accused Treebhoowoon today said that he was also “so sad about the lady” but added that he “did no kill the lady”. Asked about John McAreavey, Valayden said that he was also a “loser” in the case but added that the trial had created a “pool of victims”, including “two innocent people inside [the courtroom]“. Both men said they wanted the investigation reopened, according to RTÉ’s Tommy Gorman. Email “Lawyer for the acquitted compares Michaela trial to Guildford Four”. Feedback on “Lawyer for the acquitted compares Michaela trial to Guildford Four”.